Mention a coastal city notable for its diverse cultural history and the twin scars of natural disasters and human-made racism and generational poverty, and most people will think New Orleans, especially during the ten-year anniversary of Hurricane Katrina. However, Charleston fits that same complicated profile and shares with New Orleans the historical failure of public schools to serve equitably poor and black, resulting in both cities being targets of wide-scale and often reckless education reform driven by political ideology. While I have criticized mainstream media for covering education reform uncritically, I was impressed with the detailed examination of education reform in the large school district serving the city: Left Behind: The unintended consequences of school choice. This coverage and related data are not new to those of us having taught in SC for decades. It takes very little effort to recognize that both traditional public schools (funding, teacher assignment, student tracking, etc.) and education reform driven by accountability and market forces over the past three decades have not served well vulnerable populations of students. Nonetheless, the Left Behind series is a rare and fertile opportunity to address that because the coverage does, despite some flaws, present the complicated challenges that face both public education and society, ones that are inextricable from racism and poverty. 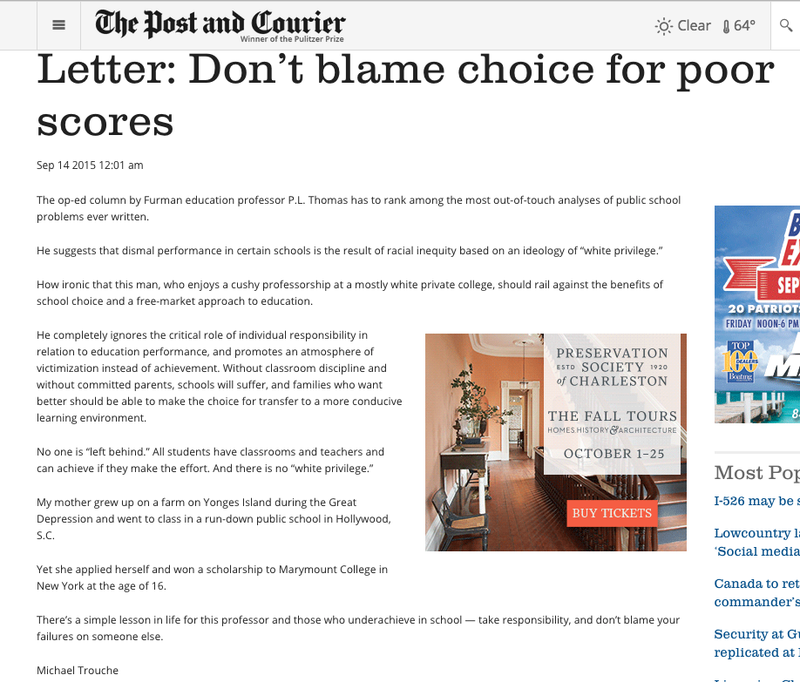 One response to this series, a South Carolina Policy Council (SCPC) Op-Ed titled School choice is a solution, not a problem, fails that opportunity because reducing the lessons of Charleston public schools to a debate about school choice is a distraction that will never serve students, families, and the community well. As I have examined on far too many occasions, free market think tanks do not represent accurately school choice because they have committed entirely to one ideological focus that trumps goals such as educational equity for black and poor children. The Op-Ed response to Left Behind is primarily advocacy, without credible claims about either the results or promise of school choice (vouchers, tuition tax credits, public school choice, charter schools). Having written a book-length examination of school choice, I regret the choice debate remains trapped in ideological and political squabbles while children are in fact left behind. Private, public, and charter schools have about the same range of measurable student outcomes, regardless of the school type and strongly correlated with the socioeconomic status of the child’s home. Research on school choice has shown mixed results at best, but even when some choice has shown promise of, for example, raising test scores for black, brown, and poor students, those increases are linked to selectivity, attrition, greater funding, and extended school days/years—not choice. School choice, notably charter schools, has increased racial and socioeconomic inequity: segregation, inequitable disciplinary policies and outcomes. SC advocacy for charter schools as the newest school choice commitment fails to acknowledge that charter schools in the state are overwhelmingly about the same and often worse than comparable public schools, and the South Carolina Public Charter School District is among the top four worst districts in the state for racially inequitable discipline with blacks constituting about 19% of the enrollment but over 50% of suspensions/expulsions. But don’t poor children deserve the same choices that rich children enjoy? Several problems exist within this seemingly logical assertion. First, suggesting that affluent and mostly white affluent children are thriving because of choice is a mask for the reality that the key to their success is their wealth and privilege. Being born into a wealthy family trumps educational attainment, and white privilege trumps educational attainment by blacks. Further, no one should have to wait for market forces might accomplish to have access to health care, justice, safety, or education. The great irony is that for the free market to work, a people must first insure equitable public institutions. A full and robust commitment to public education is essential to the concurrent commitment to the free market. The paradox is that in order for choice of most kinds to work in a free society, some essential institutions must render choice unnecessary. As we can witness in New Orleans, the lessons of education and education reform in Charleston are two-fold: (1) historically and currently, traditional public schools have failed/do fail vulnerable populations, specifically black and poor children, and (2) accountability-based and free-market education reform has also not alleviated the burdens of racism and poverty, but too often has exacerbated the devastating consequences of both. ← Greenville News: COMMENTARY: Are black children criminalized in schools?